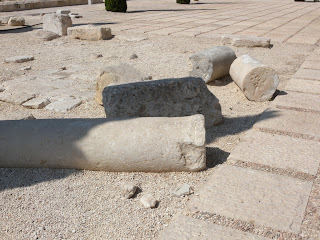 Jewish date: 29 ’Elul 5770 (Parashath Ha’azinu). Today’s holidays: ’Erev Ro’sh hashShanah/Eve of the New Year (or one of them anyway) (Judaism), Ramadan (Islam), Birth of Mary (Roman Catholicism), Feast Day of St. Jill St. John (Church of the SubGenius), Nativity of the Theotokos (Greek Orthodox Christianity), Feast Day of Robertus de Fluctibus (Thelema). Worthy cause of the day: “Protect us from toxic coal ash”. That is a big pile of blocks. 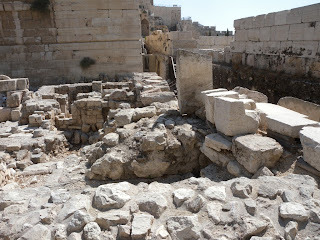 The same sort of huge blocks which make up the retaining walls of the Temple Mount. And there are an awful lot of these huge blocks lying around in the Park. These are pieces of stone too large to be dislodged easily; even 2,000 years later, the retaining walls of the Temple Mount are still standing. The Romans had to expend a lot of effort to knock them over the edge. There are also rather a lot of pieces of columns lying around. Unlike the Western Wall, at the Park there is little reluctance on the part of the caretakers to show the place in a desolate state. 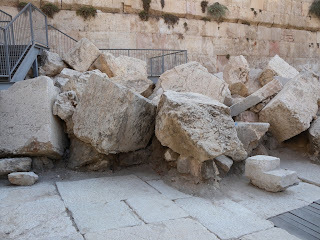 What I saw that the Romans did makes me wish I had done my pilot trip right before the Nine Days rather than waiting until ’Elul, as the Nine Days commemorate the destruction of both Temples. Also to be noted is how much the Islamic and Christian rulers from 70 CE to 1948 cared about the Temple Mount: they really did not. The Muslims built on top of the Temple Mount in order to assert the supremacy of Islam over Judaism, and the Christians temporarily turned the Dome of the Rock into a church to assert their own supremacy. But neither bothered to clean up the mess made by the Romans. The Park is an area where they had stalls to sell sacrificial animals and materials, as well as money-changers and ritual baths—a place necessary for the proper functioning of the Temple, but hardly glamorous. Now at least these stones are getting serious scholarly scrutiny. But given the current political climate, I expect it to be some time before everything is returned to its correct place. And, yes, this is where Jesus reportedly went crazy. The writers of the Gospels were no fans of the sacrificial service or any other Jewish institution. 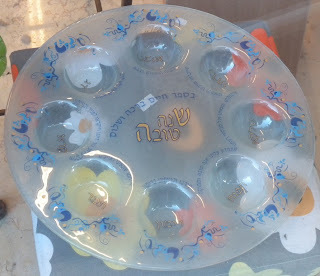 This is evidently meant to be the Ro’sh hashShanah equivalent of a sedher plate. Each of the compartments is labeled with the name of a different symbolic food. Symbolic foods are a form of prayer performed by eating something meant to reflect a wish. All the names on this plate are Hebrew and Aramaic, easily making for untranslatable wordplay. For an English example, some people on Ro’sh hashShanah eat lettuce, half a raisin, and celery, the wordplay intended being “let us have a raise in salary”. (Yes, that is groan-worthy.) The symbolic foods listed on this plate (from the top, going clockwise) are: black-eyed peas, leek, beet, apple, pomegranate, date, squash, and fish. For some reason, the head of an animal is left out. (If anyone knows anything about the legality of selling cow brains for food in Israel, please let me know.) One could also argue something is wrong when honey is omitted, though to be fair it is rather messy and often kept in a squeeze-bottle. The point of this plate is clearly commercial. There is no obligation to have all symbolic foods on the same plate or stick to a standard set. Lettuce-half-a-raisin-celery is very recent, and there also have been symbolic foods based on Yiddish wordplay. Still, at least this is a better idea than the plastic shofars. Yes, someone hacked a Muppet skit.